The article deals with the relationship between the literature of the Estonian diaspora in the West and Soviet Estonia during the 1960s, and explores the possibility, from the literary historiographical perspective, of integrating the two bodies of Estonian literature. Near the end of The Second World War close to 70,000 Estonians fled their homeland, fearing Soviet repression; among them were numerous members of the academic and artistic intelligentsia as well as eminent poets and writers. By the late 1940s national organizations, publications and other activities were already well underway in the displaced persons camps. During the 1950s, Estonian exiles who settled in Sweden, Canada, United States, and elsewhere in the West quickly formed national cultural centres, publishing houses and numerous organizations that helped maintain their national and cultural identity. The centre of literary activity in the West was Sweden, which most Estonian writers had chosen as their new home. The Estonian Writers’s Co-operative publishing house, established in Lund in 1950, started the mail-order distribution of Estonian literature throughout the world; elsewhere, the publisher Orto operated in Toronto. While no propaganda-free literature or literature of any artistic merit was published in the 1940s and 1950s in Estonia during the Soviet occupation, exile literature flourished. Then, the Khrushchev Thaw brought about changes to Soviet society in the late 1950s. As their world became more free, a new generation of talented young poets emerged who generated innovations in poetry and modernized literature. This article maps literary contacts between the Estonian homeland and her exiles, and, using archival material, focuses on personal contacts among the literati during the 1960s. Literary historiography began investigating the possibility of treating Estonian literature in the homeland and in the West as one body of literature, when, after a 45-year interruption, Estonian and emigré writers met again for the first time in 1989 in Helsinki. Afterward, critics began describing Estonian literary history with the metaphor of a tree with two branches. Treating the two bodies of literature as one and integrating their literary histories was seen as impossible due to vast differences both in writers’ circumstances and the role of literature in their communities during the past 45 years. For example, while emigré writers had to find time for creativity after their workday, Estonian authors in the homeland earned their bread by writing – literature being highly regarded and honoured – since the Soviet regime valued the role of literature (and other arts) as a propaganda tool. The article points out that although literature retained its major „official“ role and was subject to ideological control even after Soviet society became relatively freer in the 1960s, a considerable amount of homeland Estonian literature nevertheless carried on the ideas of cultural identity and resistance „between the lines“. After the independent Republic of Estonia was reestablished in 1991, the Estonian Cultural History Archives of the Estonian Literary Museum started receiving the personal archives of exile writers; researching these materials has resulted in many discoveries. It became apparent that among the correspondence between the homeland and diaspora communities there was a steady stream of letters between Estonian writers, especially the younger generation of authors, but also academic researchers, as well as many other creative individuals, artists and musicians. Although exiles’ contacts with the homeland generally began on the basis of family relations, the intelligentsia of occupied Estonia was also looking for professional and creative contacts. Many Estonian writers abroad carried on „cultural correspondences“ with their contemporaries back in the homeland in which they discussed literary problems and exchanged large quantities of books: much new Estonian literature from the homeland quickly reached the West; similarly, Estonian literature published in the West reached the homeland, from where it was distributed by unofficial channels and often through multiple typewritten copies. This cultural practice resulted in an interesting paradox: while young emigré writers (Enn Nõu and others) often protested against the literary values of the older generation, writers in Estonia admired the works of major Estonian writers in exile (Marie Under, Bernard Kangro, Kalju Lepik and others). Using archival materials, the article raises questions about the two branches of Estonian literature, relationships between homeland and exile literature, and mutual influences during the 1960s and 1970s. The shift in generations changed the existing literary balance: beginning in the 1960s, literature in the homeland blossomed while writers in exile began talking about a crisis. Numerous strategies were suggested, including officially passing the torch to homeland Estonian writers and ending the publication of emigré literature. Another response to the situation was consolidation of the younger generation of exile writers. 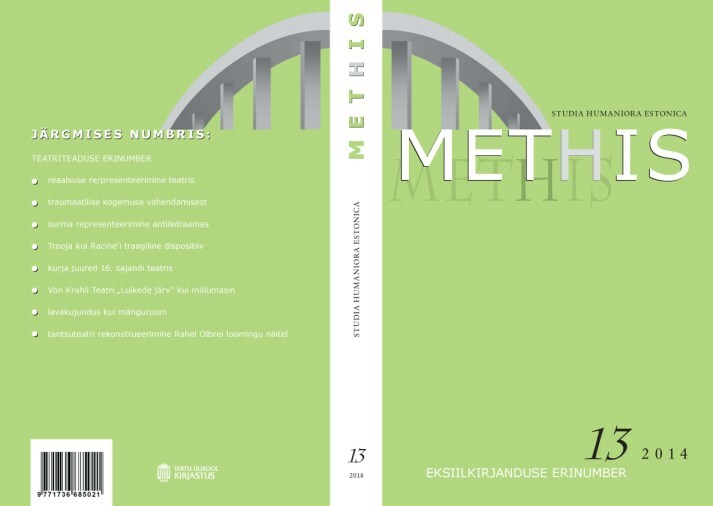 In analyzing the relationship between the two bodies of Estonian literature, the article examines the archived manuscripts and correspondence related to publishing the short story anthology Who The Hell Knows, issued by the Estonian Writers’ Co-operative in Lund, Sweden in 1968. The manuscript archive was handed over to the Estonian Cultural History Archives by the anthology compiler, writer Enn Nõu. The archive contains over a hundred letters exchanged while collecting the short stories, and which illustrate the attitudes of the second generation of exile writers toward both the occupied homeland and literature at large. Analysis of the correspondence reveals that the inspiration for issuing the short story collection in Sweden was drawn from a series titled „Young Authors“ (1962–1968), paperback poetry books by young authors issued in Estonia; there was a need among young exile writers to respond to their contemporaries in the homeland. This revealing fact verifies that regardless of shadow of the iron curtain, good relationships existed between the two literary and artistic worlds, despite the absence of official relationships, and that from the literary historiographical perspective there are grounds for treating Estonian literature as a single process.